Membership runs from May to the following April each year and includes four copies of the Society's Journal (Quarto size, typically about 70-80 pages) and four copies of the Newsletter - a more informal, A4 format, publication, together with the right to attend meetings. Please contact us if you would like a sample Journal and a membership leaflet. See our Joining Page for contact details and more information about joining the Society. 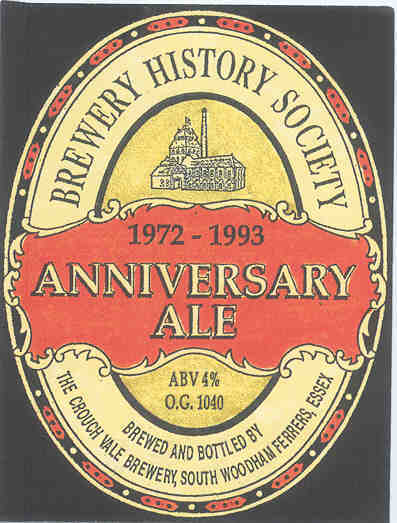 The Brewery History Society's Journal tends to contain histories of breweries and changes within the industry while the Newsletter is an informal forum for details of new breweries, brews and general news, and for members to exchange information and queries. We try to hold the AGM and at least four further national meetings at breweries during the year. Additional meetings are arranged locally and when a brewery is threatened with closure. See our Diary Page for more details. The Society makes a conscious effort to cater for the needs of its members and, at the same time, seeks to become a respected body within the brewing industry. To this end the Society does not involve itself in the politics of brewing policy. Whilst the Society obviously regrets the closure of breweries our role is to record them, not to try and stop them. Since 1985 the Society has offered Corporate Membership to organisations with an interest in the brewing industry and its origins. As a result of this we now have many breweries on the Society's roll and we have been able to assist some of these with research into their own history. The Society has plans to extend the number of meetings held around the Country to offer members more opportunities to meet each other and talk about topics of interest. Although many members devote time to researching the history of the industry, many do not and if you gain enjoyment from simply being a member then we are delighted to have you in the Society. The Society has an Archivist who is available to try and answer your queries, or at least point you in right direction, as are the various County Recorders who specialise in the area listed. I hope that you decide to join the Society and look forward to meeting you at a forthcoming meeting. Please contact me if you have any questions or would like further information.